I study prehistory with an emphasis in pre-industrial technology professionally; yes, I make a living doing this stuff. Furthermore, I have been an artisan and replicator of primitive tools for over three decades. These intertwined interests spill into every aspect of my life and I enjoy educating others, especially young people, about the survival skills and lifeways of our ancestors. Labeling this as a career can be tough as it ranges from experimental archaeology to bushcraft and wilderness survival. I strongly believe in teaching through demonstration/observation as our predecessors did for millennia. This means active learning on the part of the student just as I have done my best to seek out and learn these skills over many years. Experiential archaeology; learning by doing. Teaching the old-ways to an upcoming generation of inquisitive minds offers an alternative to media-crazed consumer culture. Reality television has no place in this field. As I hope the blog shows, my deeper interests lie in archery, woodworking, leather work, and the esoteric crafts such as music and visual art. But my pursuits go far beyond these crafts. Experimental archaeology; testing hypotheses and learning from the results. I realized long ago that I was looking for more than a job or a hobby; I was seeking a handmade life. This website shares many facets of what I do. Why would I do this? Because I remember feeling alone with these uncommon interests many years ago and it was difficult to find like-minded individuals with skills or interests in common. this space has allowed me to connect with others of similar interests around the world. 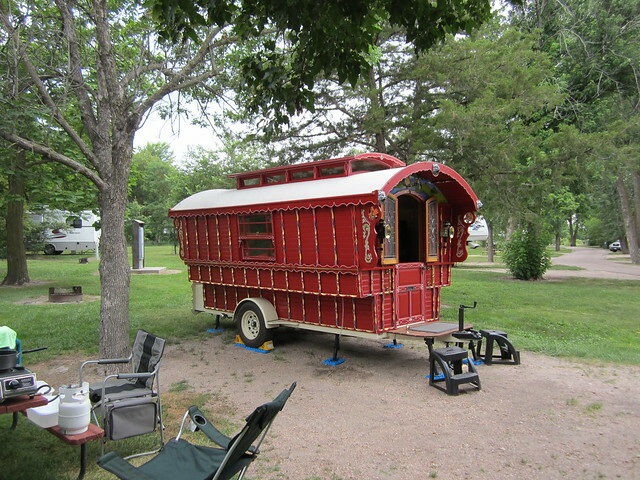 I created this blog as a place to share some projects, open discussions, and to document my build of the Vardo, my micro house My day job is archaeologist but maybe someday, when I grow up, I can earn my keep full-time as an artisan and teacher of pre-industrial technology. Feel free to drop me a line in the comments section; I’m always open for discussion. Now that is the REAL way to hunt. My son is a great hunter and fisherman but I do not like all the modern help….the deer have little chance to escape with all the techno stuff attached. Nice work! I would just like to say that I appreciate all that you, and people like you, do for maintaining the traditions that once held our collective cultures together, and still do to varying degrees. I have been doing my own bit of research, a hobby really, about traditional and ancient techniques and strategies for surviving and I was wondering if you would be interested in any of the sites that I have collected. If so, just send me an email and I will be more than happy to send them your way. Or I can post them on here, which ever is easier for you. Thanks Scott. Send them if you like. I have only put up a few but more is great. They might just need their own page. oh my. atlatls and longbows. vardos. i’m weak. this is so fun to find you! Came here via Kate’s blog, and I’m loving this much. 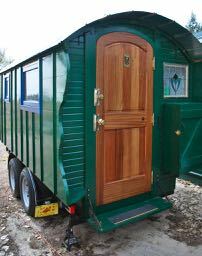 I’ve been dreaming about building a vardoesque kinda trailer for my Wife and I to toodle around in on weekend trips and absolutely LOVE yours. Had a quick question, though. I saw the jack that was originally on the tongue of the donor trailer looks like it was removed. How do you raise and lower the tongue of the trailer now? Removable jack? Folding Jack? Telekenesis :)? Welcome. Good question. The original jack was a lightweight folding crankdown with a wheel. It was only rated to 500 lbs so it could be pushing it with a couple of people, gear, and the trailer weight while camping. I also didn’t want a wheel on the front to keep it more stable while camping. The solution was just switching out the old jack for a 3000 lb flat-footed jack that folds flat to the center tongue bar. Its almost invisible as it fits snug to the frame. The whole change cost me less than $50 from the local ranch supply store. Delighted to cross your path if still only in text and pictures. Looking forward to scan this treasury you’re sharing. Likewise. From your avatar it appears you live in a yurt in Sweden? Shelter Publications, of Bolinas, California, has been publishing books about alternative architecture for the last 40 years. This fall we’ll be publishing TINY HOMES: SIMPLE SHELTER, a book about unique small homes (500 sq. ft. and smaller). We like what we’ve seen of your work and we’d like your permission to include your vardo in the book, using photos and text from your blog. I LOVE the Shelter Books! Lloyd Kahn’s photos were a big inspiration for me. Especially Shelter and Home Work. I will be glad to be included. Let me know if you need higher quality photos. I looked at your Etsy Shop. You make some beautiful jewelry. The upcycled leather is a great idea too. I am building a vardo inspired by your vardo. I live in Tennesee where it rains more so I am making my walls and roof thicker. I like your website. Lots of good information. Thanks Joe. Send a photo or link when you get one built. greatings paleotool love your site, I to use primative ways to a point. I live In the south east (georgia) but raised in the in the south west (san diego) using mostly primative ways! im know trying to pass on to the fledgling out doors people(kids) for i have come to find out most adults already know everything! any way is there any way to start a site on how to use the primtave cooking skiles? I use dutch ovens! but i have herd and seen people useing rocks to cook on! and yes I ate it due to my number one rule, expermint but you must eat what you cook! if you dont mind as it evolves ill post pictures! I spent way too much time looking through your old posts. Lots of fun and interesting stuff there. I appreciate the link and look forward to more good stuff from your blog. I’m no where near as prolific a blogger as you. May I call you George? We met you at the Maker Faire in CA in May. Your Vardo is awesome. You have choosen and inspiring path for yourself and I admire you. It is also clear that beyond your skills you are well-read and very bright. All of these aspects are very refreshing. Thank you for sharing. Thanks for the kind words. It was nice to meet you but with the several thousand people that came through, I don’t know which person you were. The Faire was remarkable for all the great people we met there. I hope to be invited back. Great website/blog! I have many of the same interests that you have. I’ll have to spend some time reading what you have put up. Keep up the good work, CW. Thanks. I look forward to hearing more from you. Nice stumbling on to your site here. Much to look at and learn. I like the scooter in your header! Got any write-ups on that? It’s my ride. I got it last year after deciding the old Yamaha was too whimpy for the highways I have to ride on to get to work. I’m working on saddlebag arrangements and other add-ons so maybe I’ll put it up sometime. Wasn’t able to find your email address on the site so I’m commenting here — I really love the leatherwork you have on display. I was wondering how you got started in it, what your methods are for the bags you’ve made, etc. Do you have any tutorials or good places to start? Many thanks! First off, thanks. I never had any instruction but I have looked at a lot of designs over the years and try to reverse-engineer them when I can. I like historical designs as they are already proven concepts. I would suggest finding a project you will find useful, getting as many examples as you can from the internet or library, and dive in! Vegetable tanned leather is the best thing in the world to start with and is cheapest when you get an entire side. It will cost some money (maybe $150) but will give you a LOT of projects. You don’t need too many tools, just a very sharp knife (stanley utility knife for straight cuts and exacto for curves will work fine for now), a good, thin awl, and some blunt stitching needles from the leather shop. I mock up all my designs on graph paper, then transfer them to Bristol Board when I feel it’s “right” and save them all for future use. I’ve recently found some great old books of designs at my library for complex bags, luggage, gloves and the like. I have also found that the leatherwork section of Deviant Art (http://www.deviantart.com/artisan/leather/) has a lot of good stuff there. A lot of junk as well but you can “favorite” the good stuff. I’m an artist in the Pacific Northwest experimenting with tool making and I’m presently building a little house on wheels. Check out the site if you get a chance and thanks for all your work on your blog. http://www.pairoducks.blogspot.com Thanks!! I had a quick peek at your build and it’s quite cool. I’ll certainly be checking out your blog when I get some time. It’s real nice to see younger folks interested in traditional archery and primitive tools. I’m 74 years old and enjoy making handmade arrows and talking about traditional archery. Thanks! I wish I had more guidance when I was young but the mistakes were all part of the learning process. Looking at your stuff I see you are a real professional. I hope to be that caliber someday myself. I would like to use one of your photos in an interactive book project I created for my students and which I’d like to offer on the website Teachers Pay Teachers. Please contact me at your earliest convenience. Love your site! just want you to know that, as an I artist and lazy maker, I really appreciate all of your beautifully crafted objects. I originally found this website while hunting for how to’s on sandal making. I was wondering if you ever teach classes in Oregon. I have not taught in Oregon BUT, my next move will likely be there or to Washington. Family and friends seem to hover around Corvallis, Eugene, Salem, Portland, Vancouver area. I hope to get up to Echos-In-Time soon. Nice stuff. I like and agree with “your story” and hope you can make it as a business too! Love the Double Rover. I would gladly make you a pack frame but it would have to be next month at the earliest. I am emailing you same so you will have my direct contact. Having trouble getting to ‘Instructables’..to buy a set of plans…? ?..any ideas..??….Thanks…g.f. OK, I tried to work out where you are, can’t read the license plates, not enough clues in the comments. But, if you are actually working bois d’arc in an Ozark barn, that’s a fairly small geographic range. I’m going to guess southern Missouri. I’m in Fayetteville, Ark. Close? Yes, I am formerly of Missouri. Raised around St. Louis, many years near Columbia on a small wooded farm there, a while near Springfield, but out West for quite a few years. I am currently in New Mexico but with many old ties to the Ozarks. Northern Arkansas is a beautiful place. Thanks for the material that you are re-blogging, I had lost track of Chris Schwartz, and the huarache film is superb. I have tried to keep my WordPress as a personal journal, hadn’t occurred to me that it could be used that way as well. Re-blogging on Tumblr, using it as a newsfeed. You have expanded my world! Wow, thanks! That’s just how it evolved for me. Partly to just keep track of the things I like for myself. Now I know where they are. The Tumbler started out as a way to save images of stuff I didn’t need on my computer. I’m still not sure about the uses of the internet sometimes but there is a wealth of good information out there if people look for it. Just checking out your BLOG. Some great stuff. Thanks. It’s been interesting, meet some good people through this, and occasionally make a few dollars for my writing. http://www.yonderjournal.com A friend in Estonia sent me this link. Thought you might enjoy. Not sure if you’ve ever seen this old book, but thought you might be interested. I enjoy your blog. Caravanning and Camping-Out by John Harris Stone. Neat looking book! Thanks a lot. I will look it over this weekend. If you don’t object, I’ll link it up to the site and credit you for finding this little treasure. Looking through this book I find I know some of these images. Uncredited in other publications and on the web I suspect! No objections. Happy to share…..
Maybe you should consider doing a presentation to groups like Castle Valley Archaeological Society about the pre-industrial technology and primitive tools…? Yes indeed. Part of my job gives me some outreach money for travel. Where is castle valley? Colorado? Nope. Price Utah. You can go to https://www.facebook.com/pages/Castle-Valley-Archaeological-Society/345542322212189 for info or call Craig at 435.888.2234. Excellent blog. Really well written, and very easy to get sucked into. I suspect I will be doing much more reading than blogging here for the foreseeable future. Wow, thanks for the compliment! I look forward to comments and criticisms, always. You are most welcome George. I absolutely loved the most recent post. Totally spoke to me. Hi George! Came across this gem of a blog all the way in India! Getting leather making supplies here isn’t the easiest but reading your blog and looking at what you’ve made is so inspiring! Love the Vardo too. Thanks! Thank you Roxanne. I am glad to reach people with these ramblings all over the world. That may be the best thing about the internet. George, would you mind if I used your image of the candle mold in a museum database (intranet) to show our visitors how a tin candle mold is used? I am desperate for one! Thanks. Have you ever heard of Blue Ox Mill Works in Eureka CA? Eric and Viviana Hollenbeck are simply amazing people who I think you would really find interesting. They have an astounding collection of old woodworking and early trade and smith tools. I like your work and am currently working on a vardo based on your basic design. Ours will be 6’6″ X 11′. I would love more details on your roof. Keep up the good work! I want something custom made from a person on etsy but they sais it was copyrighted and can’t do it and it belonged to you, so i need you to tell them it’s okay. It would only be in copyright if it was a drafted pattern. I suspect they just make what they make and aren’t interested in doing something outside their normal line. I would love to Buy your plans for the Backpack. Do you sell your patterns? Sorry, there was no pattern. Just working from others that I like. If you are capable of making the pack, then you are probably able to make your own plan for one. Figure out what you need, size, and compartments then work from there. Such a perfect collection about everything I’m interested in 🙂 Thank you so much. It was a pleasure. Thanks Kata! Feel free to comment and critique (be gentle). Thank you Eileen and welcome. I’ve not had much luck shipping overseas as the cost is ridiculously prohibitive. There are some great leatherworkers in both Scotland and England that could do you way better as mine would end up being so expensive for you. Feel free to steal the designs though if something strikes your fancy! By the way, I really love Scotland and hope to get back sometime. It’s a beautiful place with some great people. That’s a real beauty Darrel. I’m excited to look through the entire build later. Thanks for sharing!